I am loving shades of green lately and these green DaySpring tea things really fit my mood. Aren't they pretty? 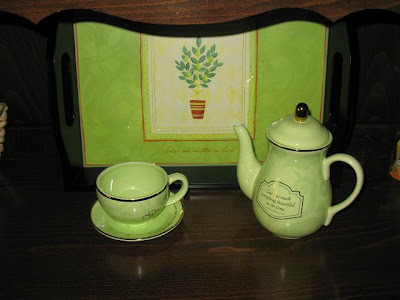 The Everything Beautiful teapot and tea cup and saucer are really nice with a green pattern, gold trim and Scripture. You can get them individually so you could even get a tea cup for you and a matching tea cup for a friend! The tray behind the teapot would be lovely for serving tea, but also makes a really nice decorative piece. It's a fairly heavy tray with a beautiful dark wood. Now I happen to love the picture that's behind the glass right now, but the bottom comes off (like a picture frame) and you can change what you have inside! I didn't get a chance to play with it yet, but I was thinking that some old-fashioned black & white pictures on top of lace would look really nice. What would you put inside? DaySpring's pretty tea things give tea time the elegant feel that it deserves. I have really enjoyed sharing these lovely DaySpring items with you over the last few weeks. No, I do not work for DaySpring. I wish! They were kind enough to notice my tea posts and blessed me with these lovely items to review. Now go find a pretty tea cup and sit back and relax for a few moments with a cup of hot tea. Or are you drinking iced tea now that the weather is warmer? I'm linking this up to Time for Tea Tuesday at Tea and Thee. Go and see some other tea posts or link up your own! Very pretty my friend. And I'm drinking HOT coffee and literally sweating while I drink it it's so hot! LOL. Yeah it's a visual you didn't need right now I'm sure. Big Need to switched to ice coffee size hugs to you. Refreshing is the word that comes to mind...I really like that tray! What a beautiful addition for any kitchen! I love that the tray can be personalized with pictures of my own! How special it would be to serve dear friends with such a pretty tea set! My teapost is about DaySpring today as well. I amloving their tea products.